Strong day for the DAX yesterday after a massive gap, driven by the US China ceasefire. 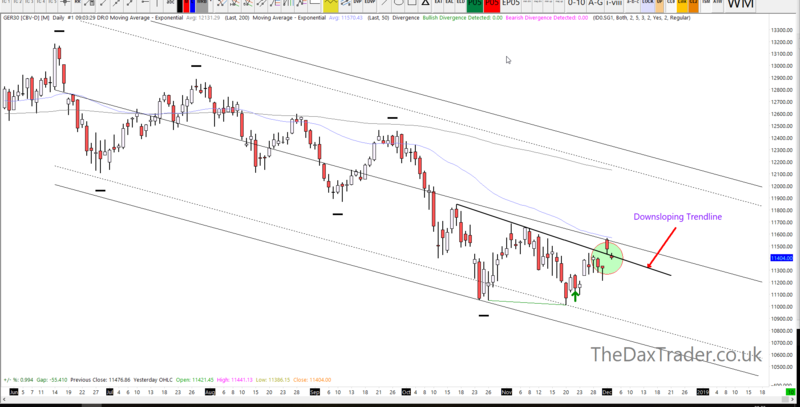 We are currently testing [from above] the downsloping trend line that was gapped yesterday, see the daily chart above. If that holds, it can provide an opportunity to get long. If it doesn’t then there is still plenty of exposed gap left to fill. Yesterday was so strong because of the reported ceasefire between US and China. The ceasefire is good news for China, because it gives politicians there more time to support the recent flagging economy. China in turn is an important market for many German companies. Shares in the auto sector benefited most from a break in the trading turmoil. BMW, Daimler and Volkswagen and some tyre manufacturers saw strong price gains and were among the top winners in the DAX yesterday. The gap lower this morning means we started trading underneath the value area from yesterday, which is bearish. So I am watching the value area low (VAL) as potential resistance and favouring shorts whilst we remain under that. 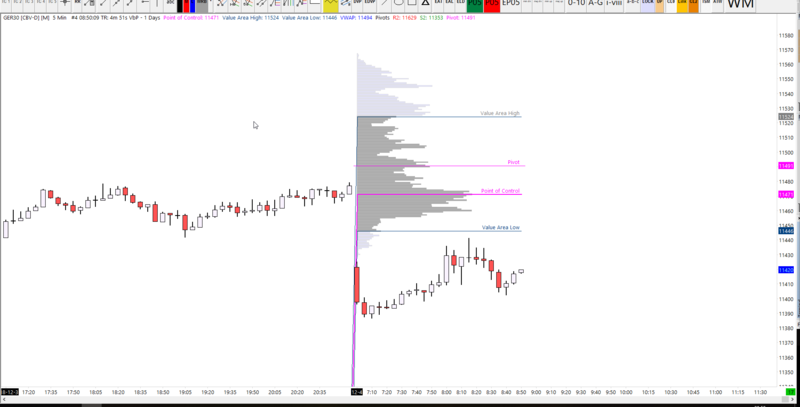 If we break through the VAL, then the most obvious target is the Point of Control (POC) and beyond that the Value Area High (VAH). It may be interesting to see a reaction at the POC, because this would also be a gap close.